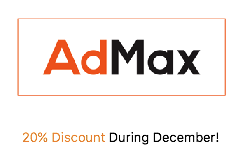 AdMax Directory is for businesses in Ireland and UK. There are categories for retail, shopping, products, services, leisure, sport industries. AdMax has an interesting mix of website to browse. All web sites listed are checked before listing. AdMax - the web directory for growing businesses and industry. Prices for listings start at £8 plus VAT for a permanent listing. New entries are normally listed within 48 hours.